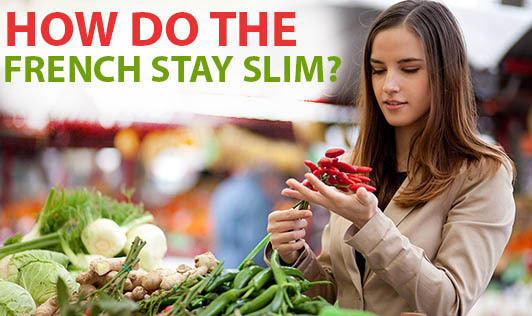 How Do The French Stay Slim? Ever heard of the French Paradox? This refers to how/why even though the French eat their meats, white bread, foie gras and pastries, their heart disease risk and weight problems are not as high as Americans or even for that matter, Indians. A few researchers have attributed the reduced heart disease risk to the French drinking wine with their meals. Another observation made by a scientist has attributed the slimness of French women to their portion control. In other words, the meal size or the quantity of food that they eat in each meal is not large. It’s just enough to keep them going till the next meal. The calorie-dense foods are also eaten in tiny portions. Wine is taken in small quantities with meals. French eat their meals leisurely with their family or friends. They do not rush through their meals, but savor every morsel. They eat only three meals in a day and do not snack in between. French women don't work out, they walk. This daily activity keeps them slim. This scene may not be typical anymore in France because of the fast food influence. But there's certainly a lesson or two for us, to keep ourselves slim and trim like the French ladies!